Do More Today. 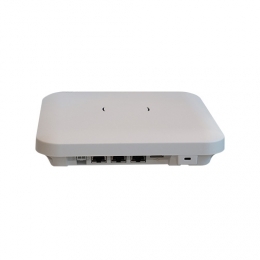 Add the Internet of Things Tomorrow with a True 802.11ac Access Point. Imagine what your business could do with a wireless network up to eight times wider and faster. Now picture having a WLAN that pushes contextual offers to customers, provides strategic-shaping analytics, and automatically wards off interference and security risks. As if that isn’t enough, the unmatched benefits of the ExtremeWireless WiNG AP 8432 don’t stop there. With built-in PoE Out (Power over Ethernet), it connects with any third-party Internet of Things network. Connect IP video cameras to count customers and reduce shrinkages; add wireless temperature sensors and more. All this can be achieved without the cost and complexity of competitor alternatives, which require multiple access points, cables, and Ethernet switch ports. Our true 802.11ac Wave 2 access point, along with the high-density optimization in ExtremeWireless WiNG 5, maximizes the value of MU-MIMO. The AP 8432 supports hundreds of wireless clients and concurrent transmissions critical for any enterprise. Using the Integrated Deep Packet Inspection (DPI) engine, along with the Extreme NSightTM Platform, the AP 8432 tirelessly optimizes the network. From RF errors to key performance indicators, the AP 8432 collects data to measure, monitor, and secure application performance. Thanks to its intelligent distributed architecture –ExtremeWireless WiNG 5 – it can proactively adjust to deliver the fastest, most reliable experience. With a modern, WiNG 5 distributed operating system, the AP 8432 offers four deployment modes to meet any requirement: stand-alone AP, virtual controller mode for creating networks of up to 64 access points, NOC controllers scaling to 25,000 access points. Access more possibilities with the AP 8432. The AP 8432 has integrated three powerful sensors that optimize security, customer engagement, and network performance. Trust the AP 8432 to deliver best-in- class PCI compliance and security with AirDefense*. Unlike other sensors that scan only part-time, this dedicated, dual-band 802.11ac sensor scans for rogue devices full time, eliminating the risk of being blindsided by them. Once a threat is detected, it is checked with an extensive security and network vulnerability signature database to proactively safeguard your network. For Security and Location Services: Monitor BT2.0 devices in the environment using the AP 8432 and ADSP Security Appliance. Map BT2.0 devices, and analyze for potential security threats. Due to its ubiquitous nature, Bluetooth is an excellent means to engage customers. The AP 8432 supports Apple iBeacon™ to communicate with a loyalty app on a customer’s smartphone. Using Google Eddystone™, enterprises can send advertisements directly to shoppers, guests, and conference attendees, even without a loyalty app pre-installed. This makes it ideal for businesses to advertise their app-download pages, captive portals, or site-specific information. Maximize performance and visibility without compromise. Using the dedicated full-time RF spectrum sensor, you can monitor and identify RF interference without slowing down throughput on the data radios. Reduce risk and lower your capital investment and operational costs with our support services. From planning to implementation to post-deployment, our experts will ensure every phase of your WLAN lifecycle is working at its peak, so you can too.